We came to the parking-lot at the end of Islandijos street - here I always find a place to park my car. 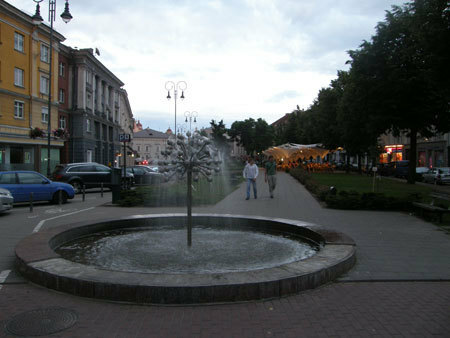 By Vilnius street we went to Vincas Kudirka square. 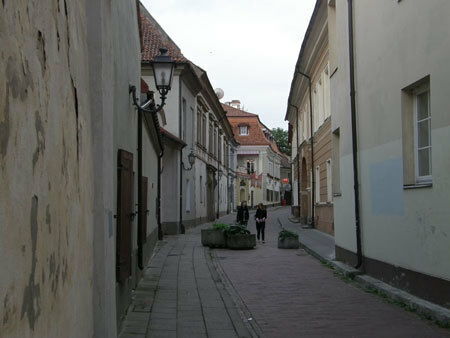 Vilnius street begins with a house, which is known by its privatization peripeteias. 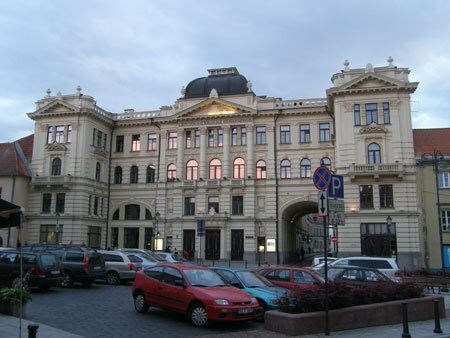 The beginning of Vilnius street and the house, known by its privatization peripeteias. This brick house is already mentioned in the beginning of the 19th century. Bigger reconstructions are made in the end of the same century. In the beginning of the great privatization the house belonged from one owner to another - it depended on whose side in the government was stronger. 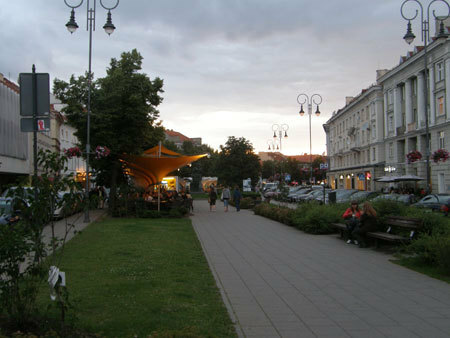 Nowadays Vilnius street is nicely ordered - there are shops and cafés on the ground floors, Vincas Kudirka monument stands in the same name square. The governments were concentrated at this place in the last century - Germans and Russians had their representations until the last year, when Vilnius clerks relocated from 9 Gediminas ave. to more spacious accommodation. 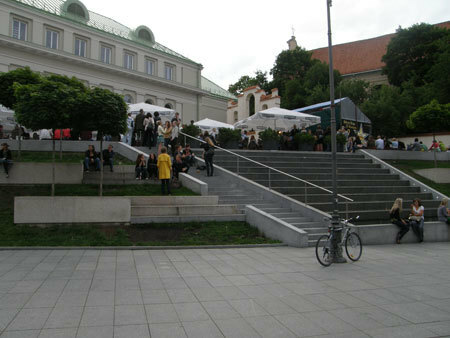 The 9th house in Gediminas avenue from the grim offices became the shopping centre, with the cozy terraces for the youth. 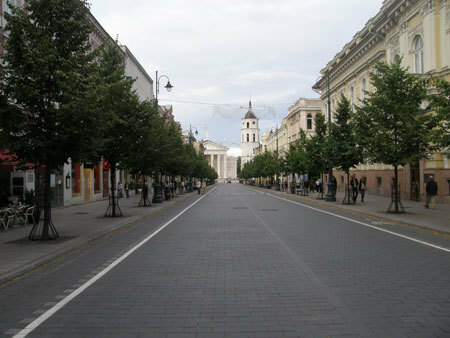 Several hundred of meters ahead, you can see the greatest Lithuania church - Vilnius cathedral. The church was started to build in the middle of the 13th century, in a place, which was not very appropriate for the construction works. 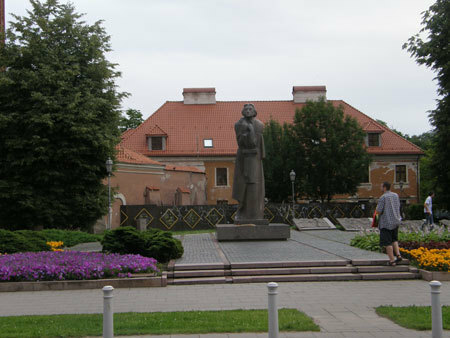 The king Mindaugas was the first, who built a Christian church. After his death, supposedly, the church became the pagan temple. 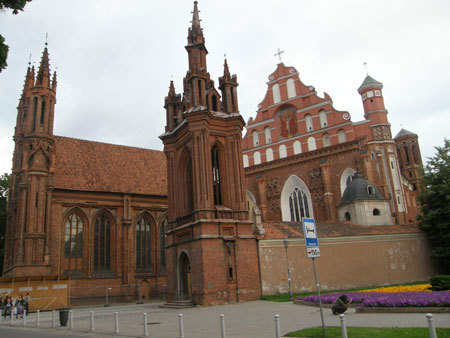 The great duke of Lithuania Jogaila rebuilt the church in the 14th century. The church was rebuilt and reconstructed several times until nowadays. 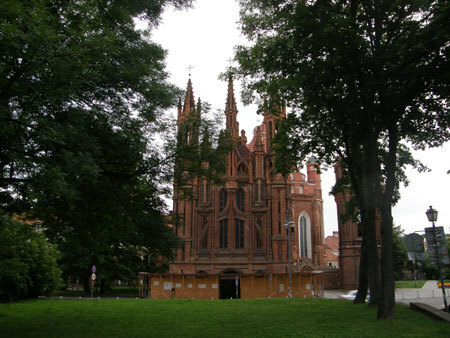 The cathedral was started to build in the recent classicism style in 1783, by a project of an architect Laurynas Stuoka Gucevicius. We can see the statues of st. Helen, st Casimir, st. Stanislaus, on the facade of the cathedral. These statues were removed and destroyed in the sixties, but rebuilt nowadays. Cathedral catacombs, which you can visit with an excursion, booked in advance, have many legends. 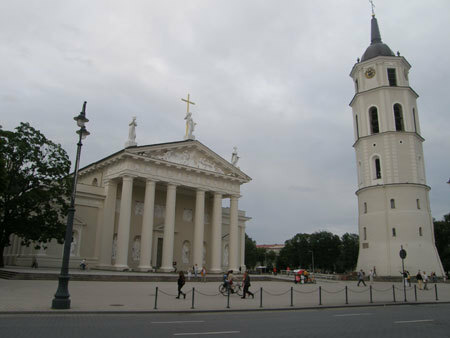 Lithuanian political and the Church leaders were buried here, also the great Lithuanian duke Vytautas and the patron of Lithuania - st. Casimir. St. Casimir body after a several journeys found peace in Vilnius cathedral catacombs. Some hidden church regalia were found exploring the catacombs in soviet times. The finders could preserve them until Lithuanian independency. 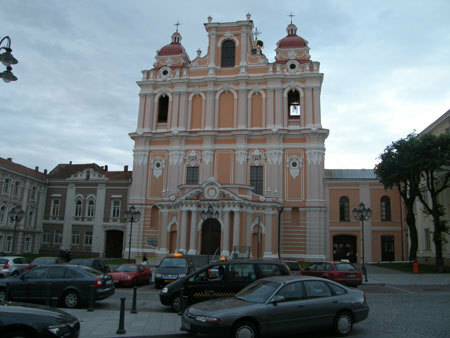 Today the Mass is being said in Vilnius cathedral, which attract pilgrims from the other countries. The high Mass is also said here on the important Lithuanian dates. 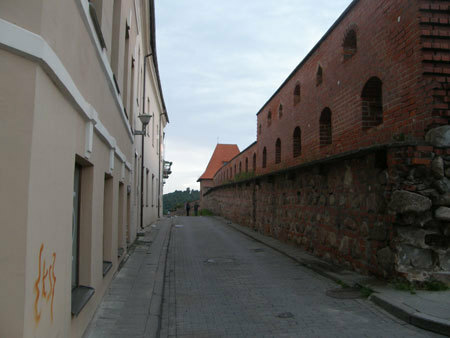 If it is not so late, we can go from the cathedral to Gediminas castle. But if it is already an evening you should miss this place, because the gate are closed after 9 p.m., and you may need to call for a firemen help to set you free. 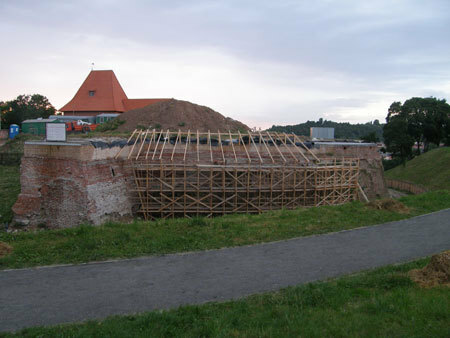 For a visit of Gediminas castle, it is worth to have about 40 minutes. 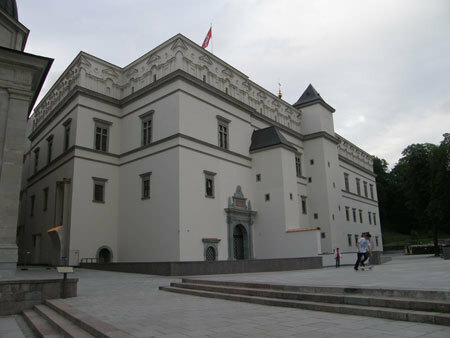 Newly rebuilt Royal Palace of Lithuania stands behind the cathedral. 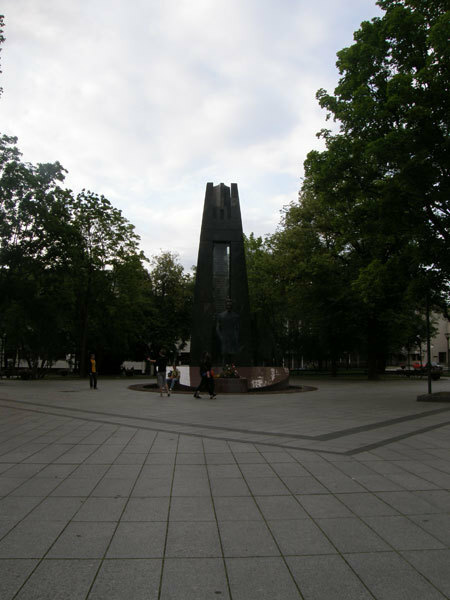 It is a timeless monument for A. Brazauskas, who governed Lithuania for years. 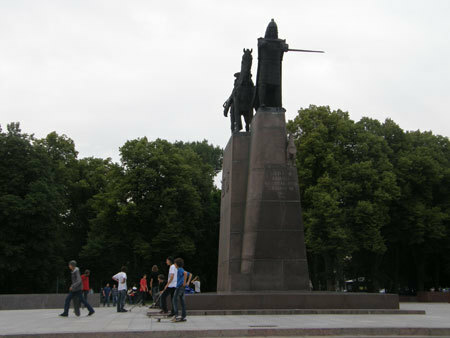 There is a monument for the king Mindaugas in front of an entrance to the Royal Palace. The king for unknown reason is standing without his horse and giving his sword to somebody. The new Lithuanian school of architecture represents these buildings, also the masterpieces found on the other side of the river Neris, also in Gediminas avenue and in front of the cathedral. 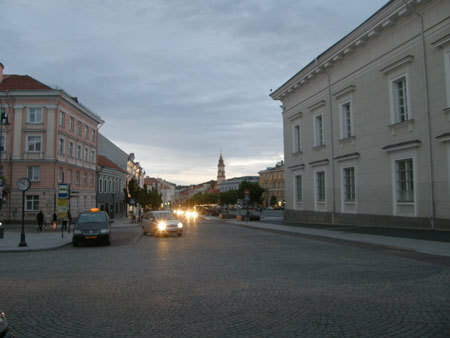 Going on foot from the parking-lot to the king Mindaugas monument takes 25-30 minutes. 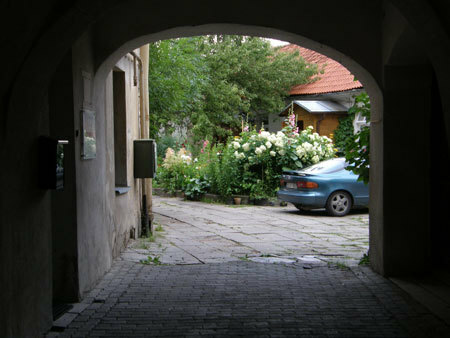 We go to the part of Vilnius, which is not damaged yet by the new school of architecture - I mean Pilies street, which always was a shelter for the artists. It is an antique narrow street of red brick houses with souvenir shops, cafés, luxury restaurants and hotels found on the ground floors. We turn to one alley from Pilies street to feel the real spirit of the Middle Ages. Here is Bernardines alley, we reach st. Ann's and Bernardines' church by it. Gothic st. Ann's church is a pride of Lithuania - every Lithuanian can tell you a legend about Napoleon, who wanted to take this church on his palm to Paris. Through the monument for the poet Adomas Mickevicius we turn to Uzupis - the republic of the artists. 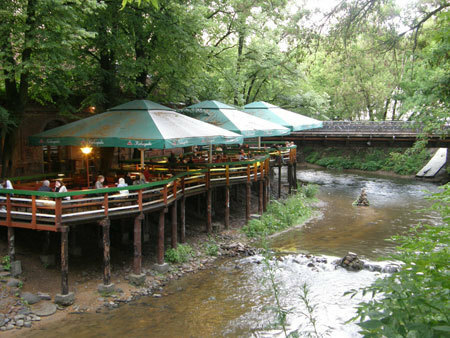 Waters of the river Vilnele, which usually cools the surrounded parks, will invite you to sit down for a few minutes and take a look of the wild ducks, diving in its waters. Despite the fact, that the little river flows through the city, there are still some fish, who likes pure water, like trout and grayling in it. Still it is better not to bade in its waters - it is full of glass chips. 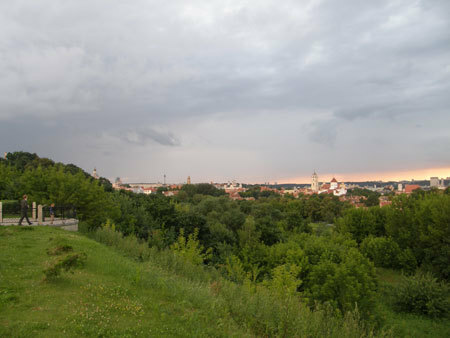 You can reach Uzupis from the king Mindaugas monument in 20-25 minutes. 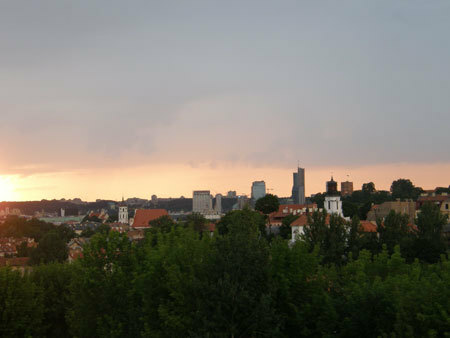 Later we go to see the roofs of Vilnius. 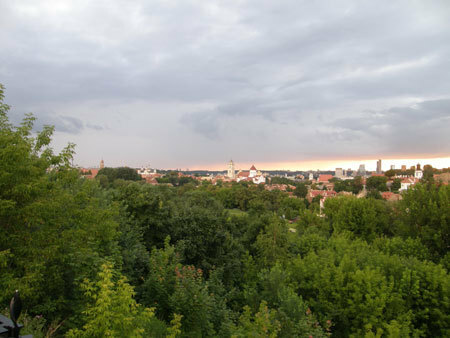 Despite the view from Gediminas castle, there is also a great view from the hill of Subacius - we can get here from Maironis street going up through Tymo quarter and Missionary church. 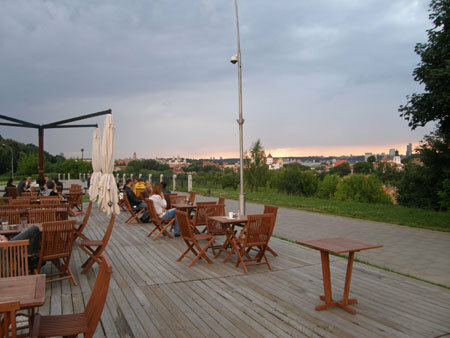 There is a platform with several café tables to sit and watch Vilnius panorama, drink coffee, relax. It takes about 10 minutes to go from Uzupis to Subacius hill. We do not come back and go by Subacius street to the city hall. Going by Subacius street, we reach the national philharmonic, where we can turn to the left to see The Gates of Dawn. 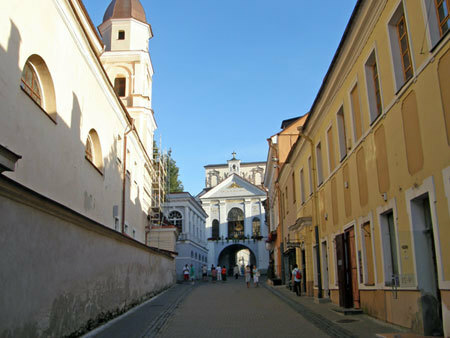 The Gates of Dawn is the old eastern gates of Vilnius, earlier it was called the Gates of Medininkai. The gates were started to build with a city wall in 1503. There is st. Virgin's painting in the st. Virgin's chapel at the Gates of Dawn. The painting is glorified like miraculous and attracts many pilgrims from Poland and other catholic countries. 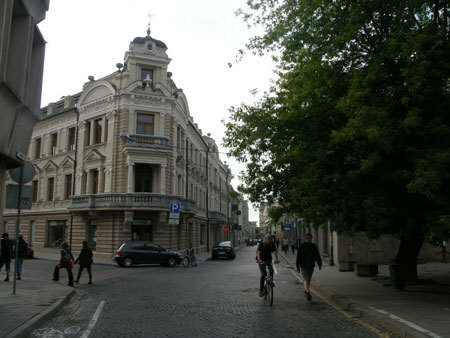 We come back through the national philharmonic to st Casimir's church and go to Vokieciu street, where we can calmly sit and relax. It takes about 15 minutes to go from Subacius hill to the Gates of Dawn. From these gates to our parking-lot - 15 minutes more of walking by Vokieciu street, if you won't go to the shops, cafés or restaurants. 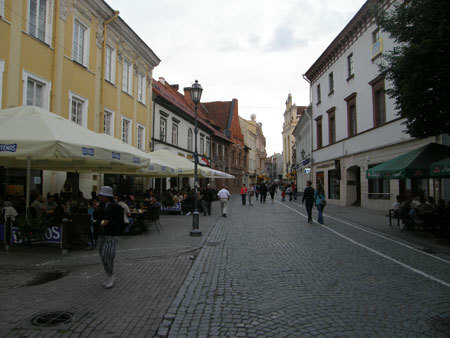 If you still have some energy, you can take a look of the old town. 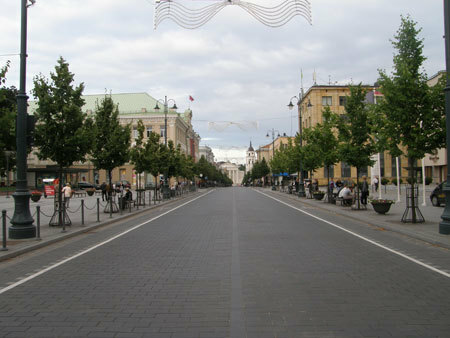 Then you can reach your car going around the city hall square, turning to Stikliai street, where you can still feel the spirit of old Vilnius alleys. 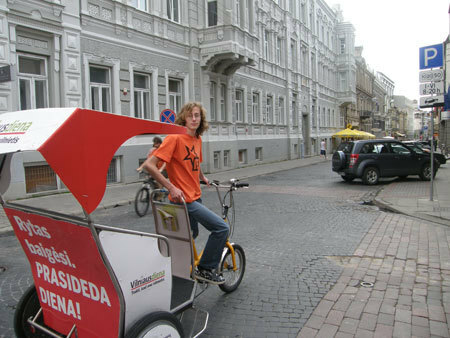 Then you can reach Vilnius University and President Palace through Gaono street. It takes about 15-20 minutes from the city hall. 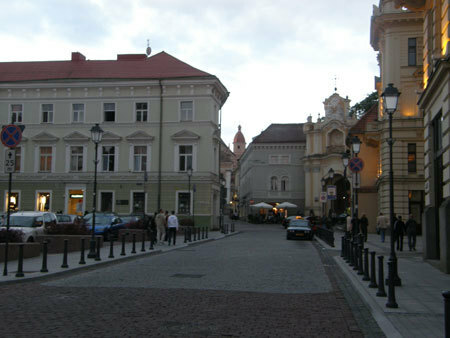 After the President Palace, we can reach our parking lot by Liejyklos street. It takes more 10-15 minutes.